Gov. Jerry Brown has launched a campaign to extend some of the most ambitious climate-change programs in the country and ensure his environmental legacy when he leaves office in two years. The centerpiece of the push is a cap-and-trade program that aims to reduce the use of fossil fuels by forcing manufacturers and other companies to meet tougher emissions limits or pay up to exceed them. The program has been one of the most-watched efforts in the world aimed at the climate-changing fuels. The four-year-old program, however, is only authorized to operate until 2020 and faces a litany of challenges, including a lawsuit questioning its legality, poor sales of credits, and lukewarm support among Democratic legislators to extend it. On Tuesday, the California Air Resources Board will release a proposed blueprint for continuing the cap-and-trade program until 2030, with a vote expected next year. Supporters credit the strategy — born under previous Gov. Arnold Schwarzenegger, a Republican, and stemming from other climate change programs initiated under Brown — with helping to cut California's overall output of emissions by 1.5 percent in its first two years, despite the massive energy demands of the state's thriving economy. With Brown set to leave office in 2018, a state appeals court is considering a challenge from the California Chamber of Commerce contending the pollution-credit program is an illegal tax, not a fee. Environmental groups say the lawsuit and overall uncertainty about the survival of the program are undermining the market for pollution credits. A May auction saw companies buy only one-tenth of the available credits, leaving the state billions of dollars short in projected revenue from the sales. Meanwhile, groups representing oil interests confirmed last week that they are in direct talks with the Brown administration over cap-and-trade. California oil companies have long sought to alter or repeal the state's low-carbon fuel standard. By 2020, those companies would be required to reduce the carbon content of gasoline and other fuels by 10 percent, a significant jump from the current 2 percent. Any deal-making on climate change would reflect a pragmatic approach to the oil industry by Brown, who took office encouraging immediate boosts in oil and gas drilling to spur California's economy, even as he promoted incentives that would reduce long-term reliance on fossil fuels. "What you're seeing now is an all-hands-on-deck effort to formulate the most responsible way forward." said Derek Walker, an associate vice president of the Environmental Defense Fund. "They're talking to the oil industry, talking to environmental groups, to organized labor — they're talking to everybody." 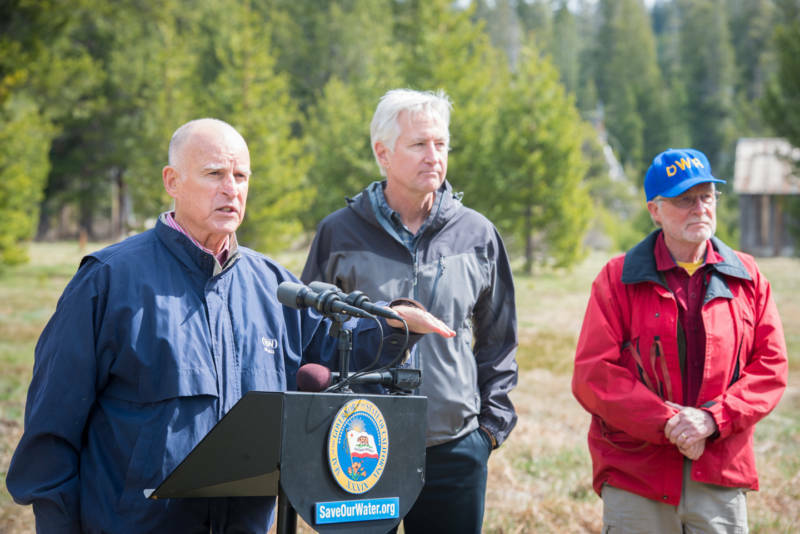 Brown has leveraged his position as governor to help draw attention to the battle against climate change. He has set non-binding mandates for increased use of solar, wind and other renewable energy sources in California in the decades to come while signing accords and global support statements aimed at easing climate change. At home, though, Brown has encountered trouble from moderate Democrats in the state Assembly who last year blocked his plan to slash statewide petroleum use in half within 15 years. The same lawmakers refused to endorse legislation by Sen. Fran Pavley, D-Agoura Hills, seeking to dramatically cut greenhouse gas emissions through 2050. Pavley was forced to scale back her proposal that now would extend only to 2030. She has since compromised even further, agreeing last month to merge parts of her plan with legislation mandating that revenues from such programs be spent in low-income communities affected by pollution. Winning legislative support could be key for Brown in ensuring the survival of the cap-and-trade program, said Jessica Levinson, a political science professor at Loyola Law School. "His ability to solidify cap and trade is a big part of being able to say to other governors, to other countries, 'We're doing something big and specific and real and it works,'" Levinson said. Should the program succumb to legal challenges, market weakness or legislative ambivalence: "Jerry Brown's fingerprints will be on whatever we ultimately decide to do," Levinson said.